Results from a regional passive airborne EM and magnetic survey in Selwyn Basin obtained in 2008 that were recently purchased by the Yukon Geological Survey and publically released in November, 2013 have been analyzed from an explorer’s perspective. The analysis highlights a strong correlation between regional conductive trends and the distribution of mineral occurrences in the region. Genetic similarities between Carlin-style gold deposits in Yukon and Nevada, where regional geologic trends are well recognized, underline the potential importance of the AEM defined conductive trends in Selwyn Basin and elsewhere. The Selwyn Basin (Fig. 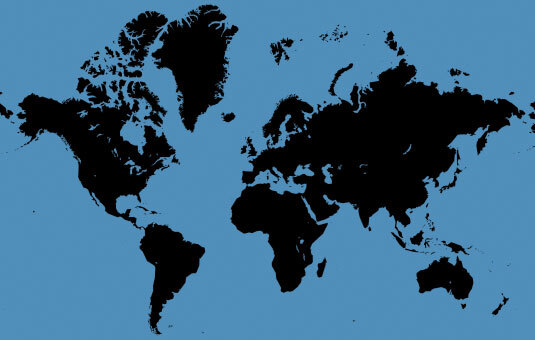 1) is a large northwest trending Paleozoic deep water sedimentary basin hat extends for 1000’s of km from Alaska, through Yukon and western Northwest Territories (NWT) and into northern British Columbia (Goodfellow, 2007). In 2008, a 25,000 km2 area of Selwyn Basin in east central Yukon and western NWT, northeast of Ross River (Fig. 1-2), was overflown in a regional airborne geophysical survey contracted by a private mining company (Witherly, 2013). The survey consisted of 24,675 line-km of helicopter ZTEM (z-axis tipper electromagnetic; Lo and Zang, 2008) and magnetics. In November, 2013, after purchasing the survey data and having them reprocessed, the Yukon Geological Survey (YGS) released them to the public (McFarlane and Nordling, 2014). These data were compared to the known geology and mineral resources, and analyzed from an explorer’s perspective by Carne et al. (2013) and are presented in this study. The Selwyn Basin is a northwest trending Paleozoic deep water sedimentary basin mainly composed of black shales and cherts of Ordivician to Devonian age (Fig. 2). The basin is unconformably underlain by Hadrynian-Cambrian- age basement grit rocks that form part of the continental margin. The Selwyn Basin consists of a lower section of Early Ordivician to Early Devonian mudstones, siltstones, carbonates, chert and minor sandstone. The upper section consists of Devonian to Mississippian and Early Triassic mudstones and siltstones, with more abundant sandstones and conglomerates. The Selwyn Basin rocks were deformed and metamorphosed during the Mesozoic. 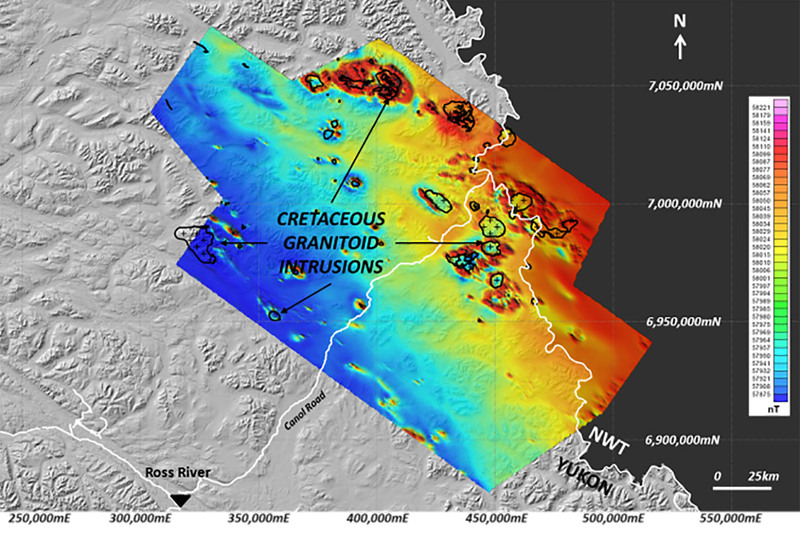 Cretaceous granitoid intrusions also occurred during this tectonic event. Except for fold and thrust deformation and metamorphism to greenschist facies, the Selwyn Basin is relatively well preserved (Goodfellow, 2007). 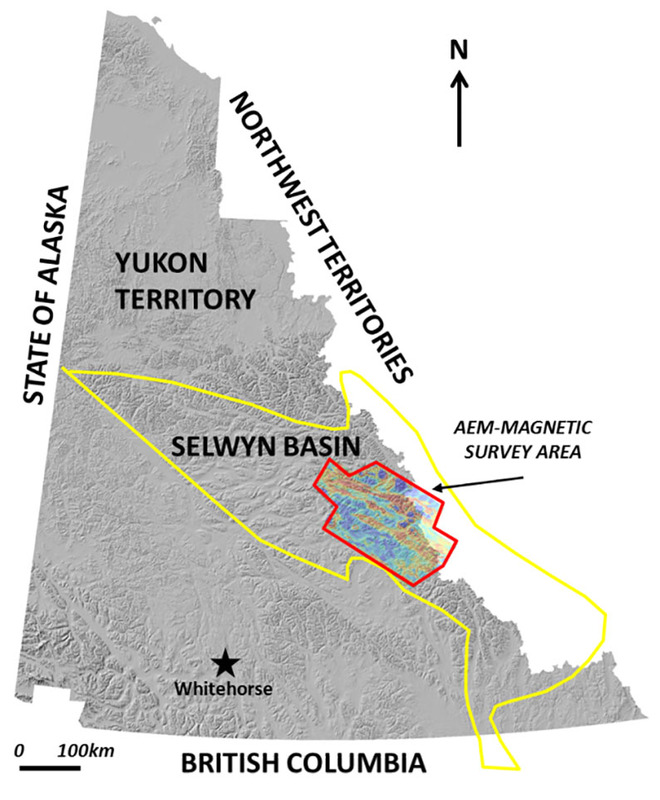 Figure 1: Location of Selwyn Basin and AEM-magnetic survey region in Yukon Territory. Figure 2: Regional geology in Selwyn Basin survey area (after Gordey and Makepiece, 1999). The Selwyn Basin is best known for its world-class SEDEX (sedimentary exhalative) deposit potential, hosting twelve major deposits with proven reserves in four major districts, including the giant Howards Pass deposits at 180 Mt indicated (Kirkham et al., 2012) and past producers Faro, Vangorda and Grum. The deposits are richer in Zn, Pb, and Ag and generally Cu and Au poor. Stratiform barite deposits and Ni-Mo SEDEX showings also occur in the basin (Goodfellow, 2007). 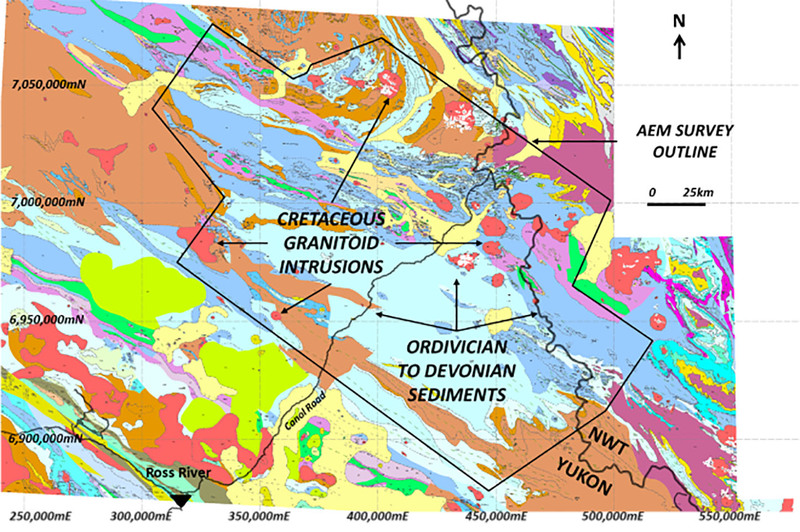 In addition, Cretaceous age Zn- Pb and W skarns, vein Ag-Pb and intrusive-related Au deposits also occur throughout the Selwyn Basin (Carne et al., 2013). 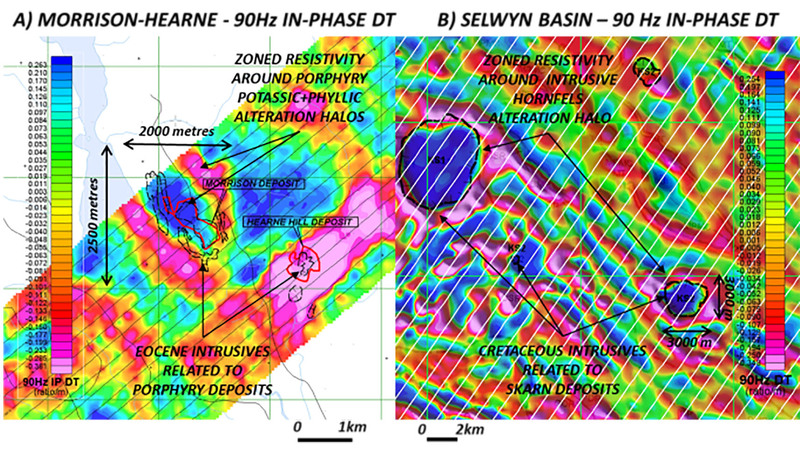 Recent discoveries of Carlin-style gold mineralization have been made 100km northwest of the survey area along the northern margin of Selwyn Basin (Arehart et al., 2013). 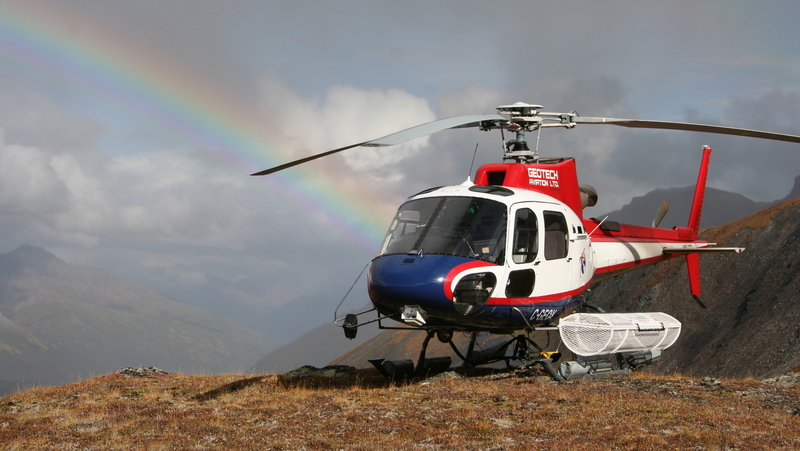 The ZTEM passive AFMAG (Labson et al, 1985) helicopter EM and aeromagnetic survey at Selwyn Basin was flown between May to October, 2008 (Witherly, 2013). It consisted of 24,675 line-kilometres of coverage using 1000 line-spacings and 500m in-fills along N-035O oriented survey lines. ZTEM tipper data (Tzx in-line & Tzy cross-line) were acquired at 5 frequencies (30-360Hz). Readers can refer to Milicevic et al. (2008) and Legault et al., (2012) for descriptions of the ZTEM survey, system and theory. 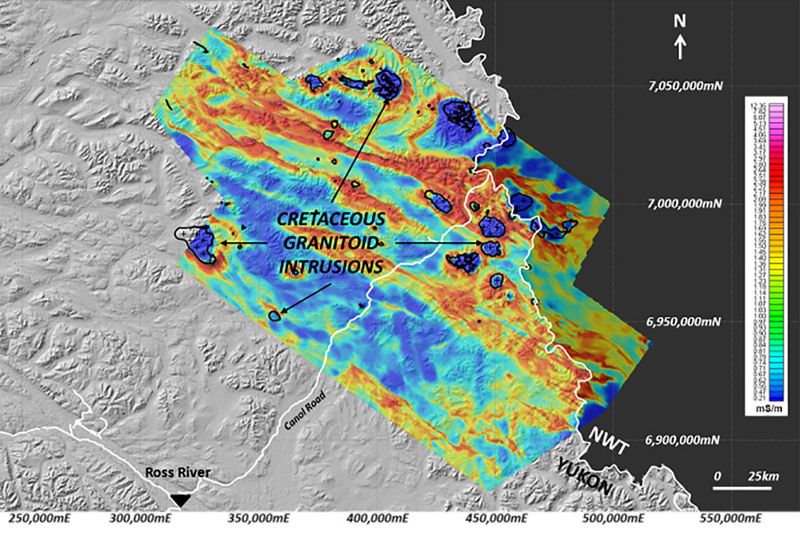 The Selwyn Basin total magnetic intensity (TMI) image in figure 3 shows the strong correlation between prominent magnetic anomalies and mapped Cretaceous granitoid intrusions; which, in spite of their low magnetic susceptibility, cause magnetic hornfels in surrounding rocks from related contact metamorphic pyrrhotite (Moynihan, 2013). In fact, the known vein-breccia and skarn deposits are intrusion related and associated with magnetic highs (Carne et al., 2013; Witherly, 2014). However, the SEDEX deposits in Selwyn Basin lack prominent magnetic signatures, due to the absence of ferromagnetic sulphides (Goodfellow, 2007) and, as shown in figure 3, the regional magnetic results also appear to contain less information on lithology and structure, due to lack of contrasts from low magnetic susceptibilities of the shale, chert and limestone host sedimentary rocks (Legault et al., 2014). Figure 3: Total magnetic intensity, with outlines of intrusions. The ZTEM apparent conductivity image in figure 3 was obtained by applying the VTEM transform of Becken and Pedersen (2003) to the In-phase tipper data, as shown in Sattel et al. (2010). 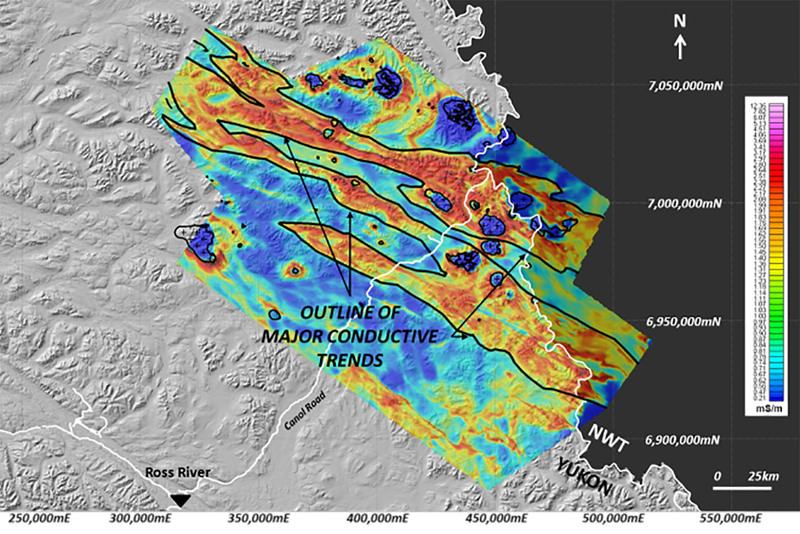 Comparing this image to the TMI in figure 3 reveals prominent circular resistivity highs (blue) and surrounding these are conductivity highs associated with igneous intrusions and the related magnetic and po- rich metamorphic aureoles. Figure 5 reveals similar good correlation between ZTEM conductive horizons and the locations of mapped faults in the district, which were not revealed in the previous magnetic results. Figure 4: ZTEM apparent conductivity (90Hz), with outlines of intrusions. Figure 5: ZTEM apparent conductivity (90Hz), showing mapped faults and intrusions. More significantly, outlines drawn around the main ZTEM apparent conductive horizons in figure 6 suggest the existence of major NW-SE trends within the Selwyn Basin that, at first, do not appear to be related to bedrock geology (see Fig. 2). However, upon further analysis, by superimposing the location of known mineral occurrences, prospects and deposits (see Fig. 7) it is revealed that these mineralized zones are clearly aligned along these major AEM conductive trends – none of which are apparent or visible in the magnetic results. Areas along strike of these conductive trends clearly merit follow-up in this underexplored region. Based on the EM skin depth of investigation estimates, these ZTEM signatures may relate to bedrock features ex- tending to depths of 1km or more and are therefore unlikely to be related to surficial overburden origins. If these are in fact related to deeper basement structures, the alignment of deposits are likened to the research of Arehart et al. 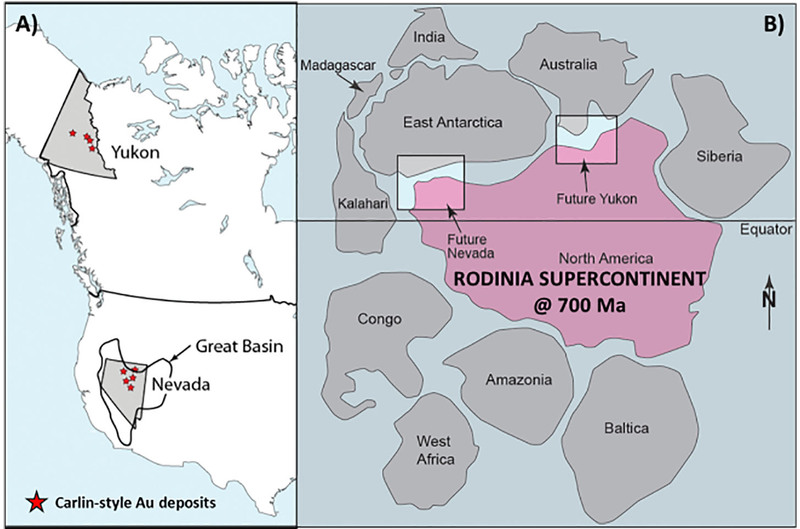 (2013) who identify close similarities in the genesis between the Carlin-type gold deposits in Nevada and Yukon, inferred to be based on their alignment in the Rodinia supercontinent 700 Ma previous (see Fig. 8). Given the importance and recognition of aligned mineral trends in Nevada (see Fig. 9), the identification of similar possible AEM defined basement trends could also be significant guides to exploration in Yukon’s Selwyn Basin. Figure 6: ZTEM apparent conductivity (90Hz), showing outline of major conductive AEM trends. 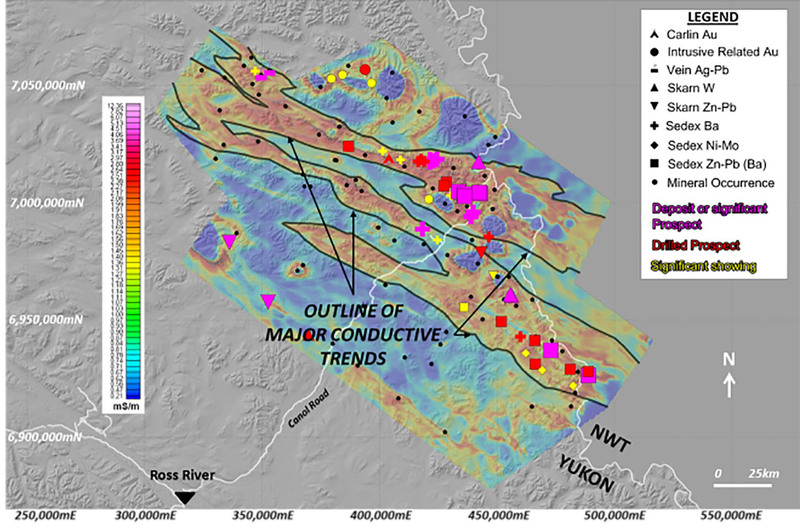 Figure 7: ZTEM apparent conductivity (90Hz), showing outline of major conductive AEM trends and location of significant mineral showings (black dots), prospects (red symbols) and deposits (magenta symbols). Figure 10 presents similar ZTEM in-phase DT (total divergence) images over porphyry copper deposit alteration halos in Western Cordillera (ref. Witherly & Sattel, 2012) and hornfels alteration surrounding Cretaceous intrusions that are also associated with Pb-Zn skarn deposits in Selwyn Basin, as shown in Figures 6-7. Figure 8: Schematic showing spacial relation of Yukon & Nevada and: A) Location of Carlin-style Au deposits, and B) Inferred location on Rodinia supercontinent (after Arehart et al., 2013). 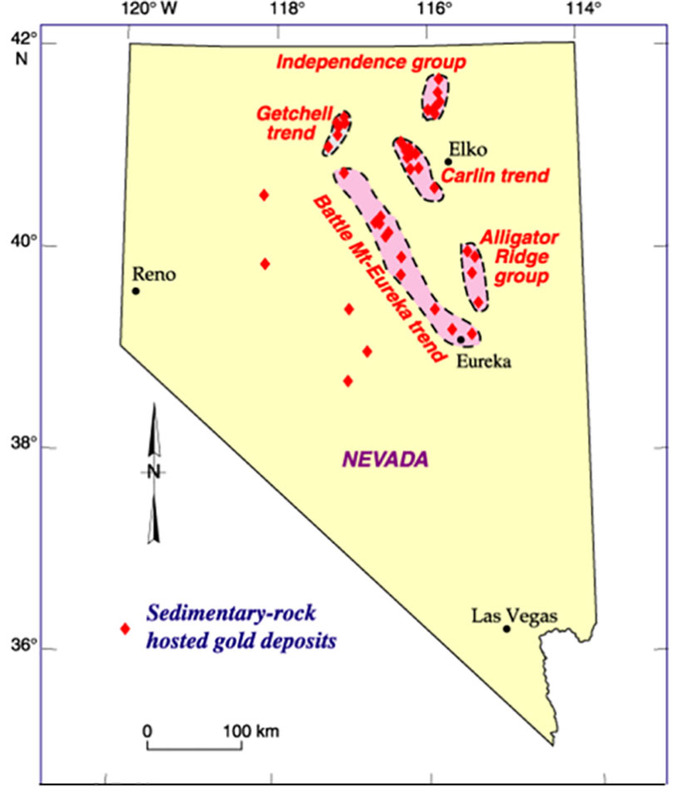 Figure 9: Schematic showing alignment of Carlin-style gold deposits along trends in Nevada (from Carne et al., 2013). Analysis of a regional passive airborne EM and magnetic survey in Selwyn Basin from an explorer’s perspective have highlighted a strong correlation between regional conductive trends and the distribution of mineral occurrences in the region, which were not visible in the regional magnetics. That these potentially deep (>1km) AEM signatures represent possible basement structural controls also points to genetic similarities between Carlin-style gold deposits in Yukon and Nevada, where regional deposit trends are also well recognized. Similarities between zoned ZTEM signatures related to Cretaceous skarns in Selwyn Basin and porphyry copper deposits in Western Cordillera are also highlighted. These underline the potential importance of ZTEM defined structural and alteration trends for future exploration in Selwyn Basin and similar applications of deep penetrating AEM in other geologic environments around the world. Figure 10: ZTEM 90Hz DT images showing similarities between: A) Cu-porphyry signatures from Western Cordillera, and B) Pb-Zn skarn signatures from Selwyn Basin. We are grateful to the Yukon Geological Survey and Ken Witherly, Condor Consulting, for the YGS 2013 workshop. Arehart, G. B., Ressel, M., Carne, R., and Muntean, J., 2013, A Comparison of Carlin-type Deposits in Nevada and Yukon: Society of Economic Geologists, Special Publication 17, 389-401. Becken, M., and Pedersen, L.B., 2003, Transformation of VLF anomaly maps into apparent resistivity and phase: Geophysics, 68, 497-505. Carne, R., Phillips, R., and Lane, J., 2013, An explorer’s take on the Selwyn Basin ZTEM survey: Presented at Yukon airborne geophysics workshop, Yukon Geoscience Forum 2013, Yukon Chamber of Mines and Yukon Geo- logical Survey, Whitehorse, Canada. Goodfellow, W.D., 2007, Base metal metallogeny of the Selwyn Basin, Canada, in Goodfellow, W.D., ed., Mineral Deposits of Canada: A Synthesis of Major Deposit-Types, District Metallogeny, the Evolution of Geological Provinces, and Exploration Methods: Geological Association of Canada, Mineral Deposits Division, Special Publication 5, 553-579. Gordey, S.P. and Makepeace, A.J. (compilers), 1999, Yukon digital geology: Geological Survey of Canada Open File D3826, 1:250,000 scale. Kirkham, G., Dunning, J., and Schleiss, W., 2012, Update for Don Deposit mineral resource estimate, Howard’s Pass property, eastern Yukon: NI 43-101 technical report for Selwyn Resources Ltd., 145 p.
Labson, V. F., A. Becker, H.F. Morrison, and U. Conti, 1985, Geophysical exploration with audio-frequency natural magnetic fields: Geophysics, 50, 656–664. Legault, J.M., Latrous, A., Zhao, S., Bournas, N., Plastow, G. and O’Donnell, J.J., 2014, Passive airborne EM and magnetic results over SEDEX lead-zinc deposits at Howard’s Pass in Selwyn Basin, Yukon, presented at 36TH Annual Convention, Seminar and Exhibition of the Association of Exploration Geophysicists, Hyderabad, India. Lo, B., and Zang, M., 2008, Numerical modeling of Z-TEM (airborne AFMAG) responses to guide exploration strategies, SEG, Expanded Abstracts, 1098-1101. MacFarlane, K.E., and Nordling, M.G., 2014, Yukon Exploration and Geology Overview 2013: Yukon Geological Survey, Energy, Mines and Resources, 80 p.
Milicevic, B., Laloo, S., Legault, J., and Kumar, H, 2008, Survey report on a helicopter-borne z-axis tipper electromagnetic (ZTEM) and aeromagnetic geophysical survey Selwyn Basin, Yukon, Canada, report (8002) by Geotech Ltd for Exploration Syndicate Inc., in Witherly (2013), 43p. Moynihan, D., 2013, An introduction to the geology, tectonics and metallogeny of the Selwyn Basin area: Presented at Yukon airborne geophysics workshop, Yukon Geoscience Forum 2013, Yukon Chamber of Mines and Yukon Geological Survey, Whitehorse, Canada. Sattel, D., Witherly, K., and Becken M., 2010, A brief analysis of ZTEM data from the Forrestania test site, WA: 21ST International Geophysical Conference and Exhibition, ASEG, Extended Abstracts, 4 p.
Witherly, K., 2013, Report on processing of ZTEM magnetic and EM surveys, Selwyn basin area, Yukon, Canada: Yukon Geological Survey miscellaneous report MR-9, 49p. Witherly, K, 2014, Regional airborne geophysical assessment of the Selwyn Basin area, Yukon-NWT: Presented at PDAC Prospectors and Developers Convention, Geophysics Session, Toronto, Canada. Witherly, K., and Sattel, D., 2012, The application of ZTEM to porphyry copper-gold exploration, 22ND International Geophysical Conference & Exhibition, ASEG, Extended abstracts, 4 p.